Please buy a money pouch for Eating Izushi-soba Tour(JPY1,800). There are three Eiraku-tsuho ( coin in old period) in the porch. It entitles you to order one portion of Izushi-soba (three plates) at three different shops.This money pouch is made by Izushi silk crepe. Izushi silk crepe with stylish woven pattern, soft and noble appearance is a Japanese traditional beauty. You can also keep and use the pouch after the tour. “Eiraku-tsuho” is family crest for Sengoku family, feudal load of Izushi, “Mu” is flag crest for Sengoku family. 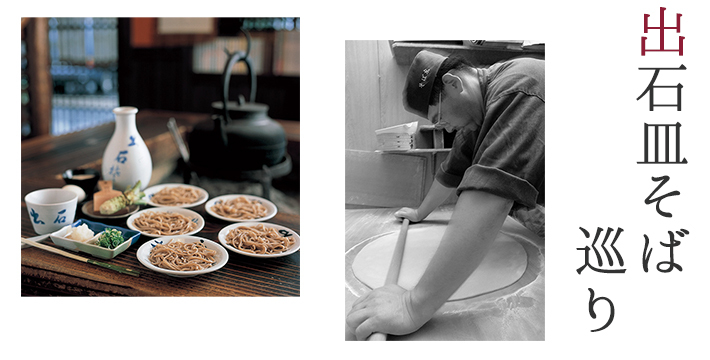 You can find about thirty-eight restaurants available for eating　soba tour on a Izushi soba map . Please show your money pouch when you order the soba. You can’t share Eiraku-tsuho coin in the money pouch with the other people. You can use one coin only for one restaurant. The money pouch is available for three months. 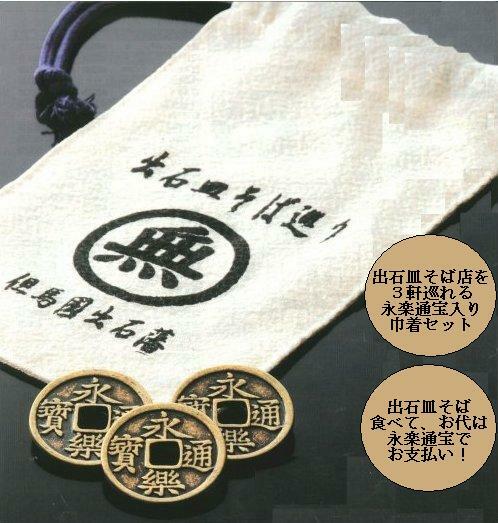 You can’t change Eiraku-tsuho coin with money.
) at the following facilities when you show your money pouch. The former residence of a senior samurai in the late Edo period, which was located within Izushi Castle. The former residence of a wealthy merchant who traded silk in the Meiji period. It has been exhibiting historical materials mainly related to Izushi-han as a museum since 1977. A rare quasi-Western wooden structure built in 1887 as a prefectural hall. Offering a permanent exhibition of Izushi’s well-known personalities including Mr. Tsutomu Sakurai. It is a designated cultural property of the city. Taking pride in offering hot water in large quantities and a silky and smooth texture. The souvenir shop whitch　have regional goodies of Izushi, near “shinkoro” . save 5% on souvenirs with some exceptions. Izushi Bikkura is a rest house whrere you can get regional goodies of Izushi, take a rest and light meal. Exhibiting a large number of art works by Mr. Kiyonaga Itoh (born in Izushi), paintings from his childhood to death, and his favorite painting tools.